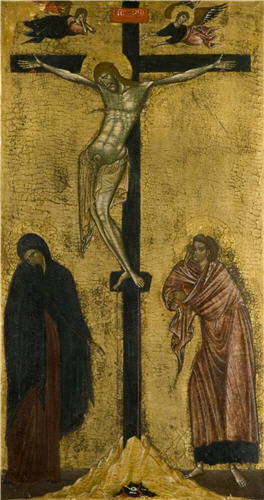 The Virgin Mary and Saint John the Evangelist mourn at the foot of the cross. 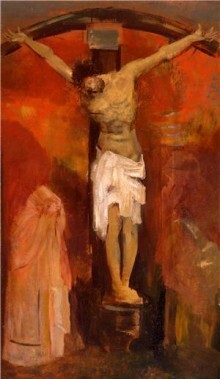 Their anguish directs attention to the humanity of Christ and his suffering. Such small scale devotional paintings sought to deepen and inspire faith, encouraging a direct emotional response. The panel was probably originally paired with another of the Virgin and Child. It has also changed in appearance. The gold background has been renewed and the green underpainting on Christ’s body now dominates.